I’ve been busy with a couple of household projects the last few days. 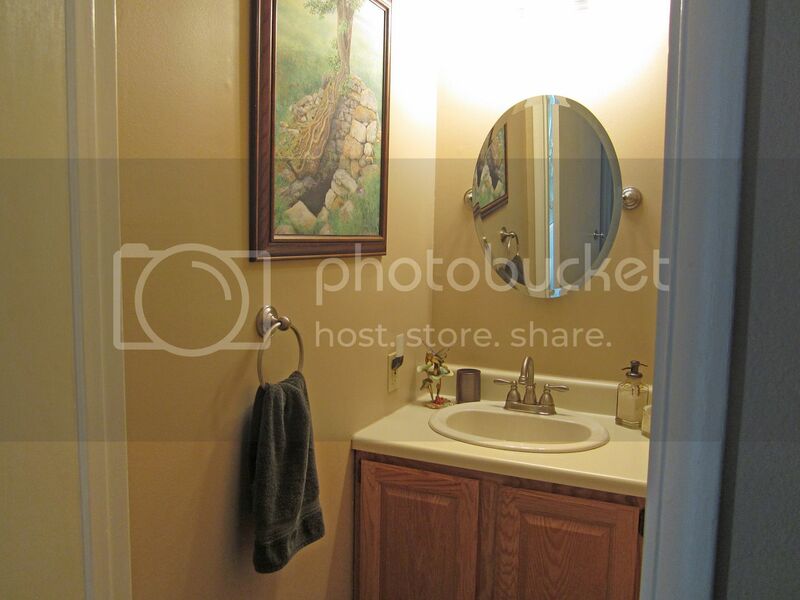 I first decided to redo my powder room. The walls were a very deep cranberry red (Fire element). I had a “Safari” theme going in the room. A picture of Zebras, A picture of Giraffes (with lots of gold tones in the pictures for contrast with the red), a statue of a giraffe, a small red and gold rug, etc. The majority of my house is done in Earth tones – greens, browns and beiges. (The exception is Ted’s bedroom which is blue (Water element) and his bathroom which is yellow (Sun element). 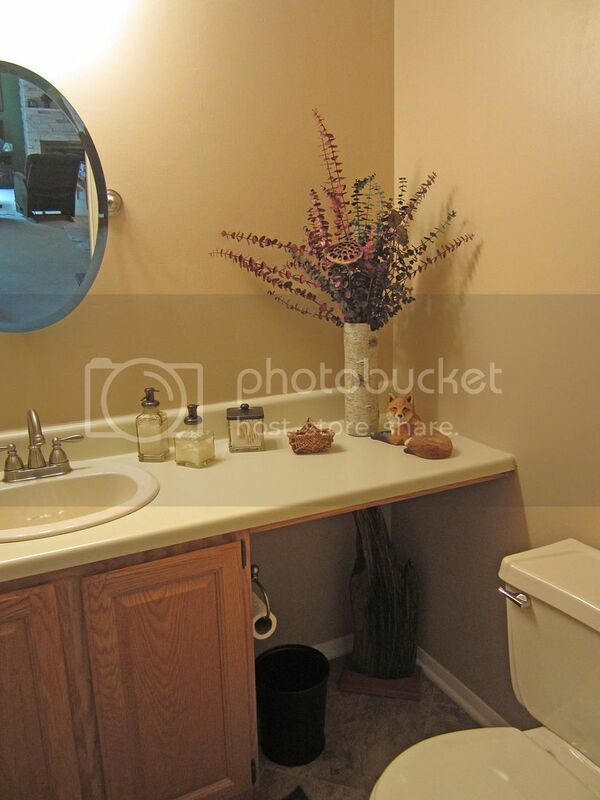 Now my powder room has now been converted to Earth Tones with a woodland theme. My second project was my bedroom closet. A couple of months ago, I had asked Ted to remove the double bi-fold doors for me as they simply took up too much space. 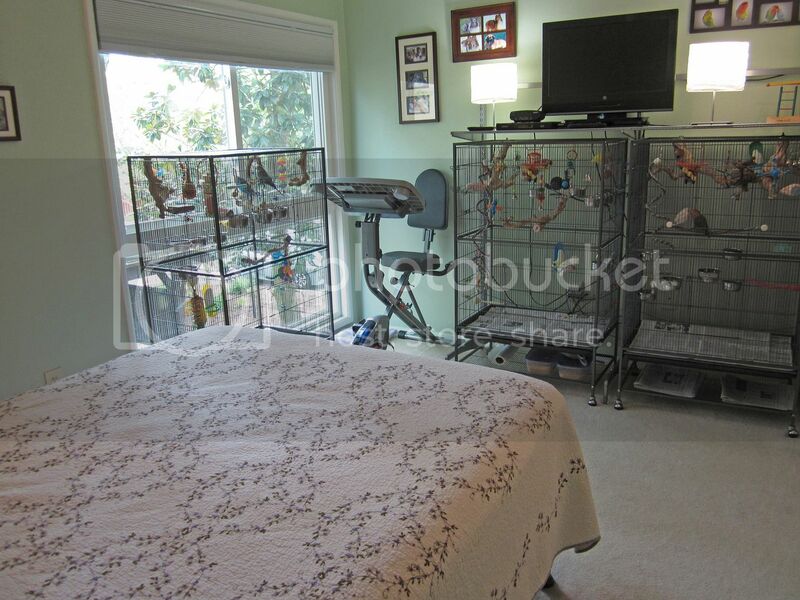 I have three F040 flight cages in the bedroom that all get moved from place to place in the room multiple times throughout the day. 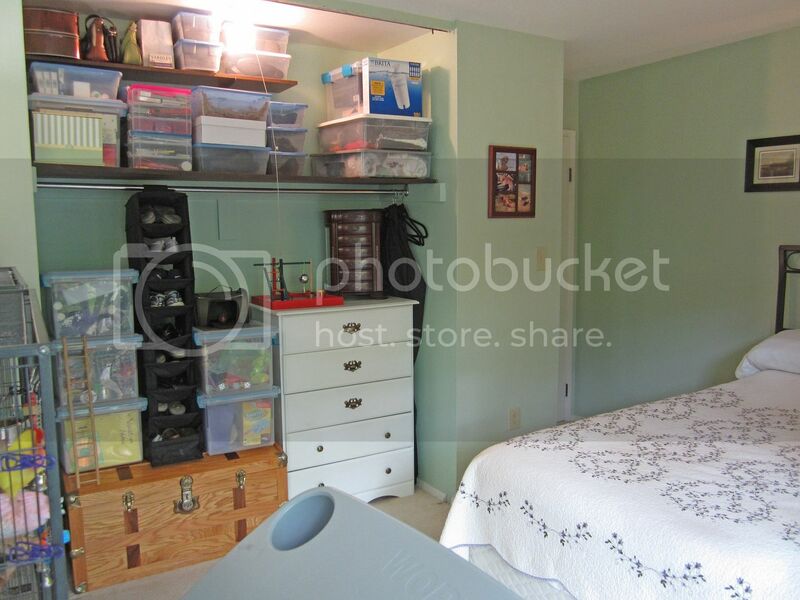 The problem was that the interior of the closet had never been painted when my bedroom was painted a couple of years ago. 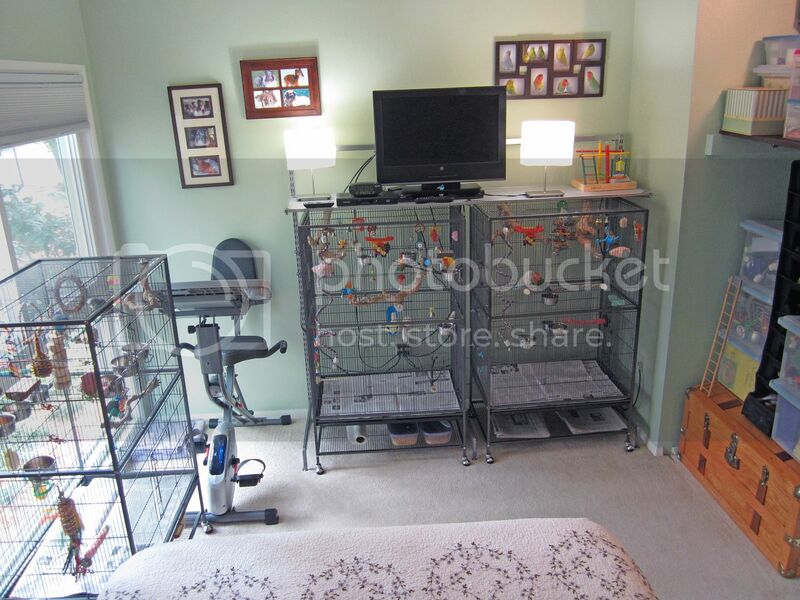 Even though not wall space actually shows due to everything I have to store in the closet, when I was working out on my exercise bike or even lying in bed watching TV, the distraction of the clash really bothered me. I finally decided to take things in hand and do something about it! I won’t even tell you how long it took for me to empty every single thing out of the closet (and out of my room) so that I could actually prep and paint. But, a couple of days later, everything has been painted and the closet reassembled. Lovely gentle colour schemes, very calming. I find redecorating is very cathartic and all the prep work is a good opportunity to declutter. Enjoy the fruits of your labour and relax in your tranquil setting, you deserve it. 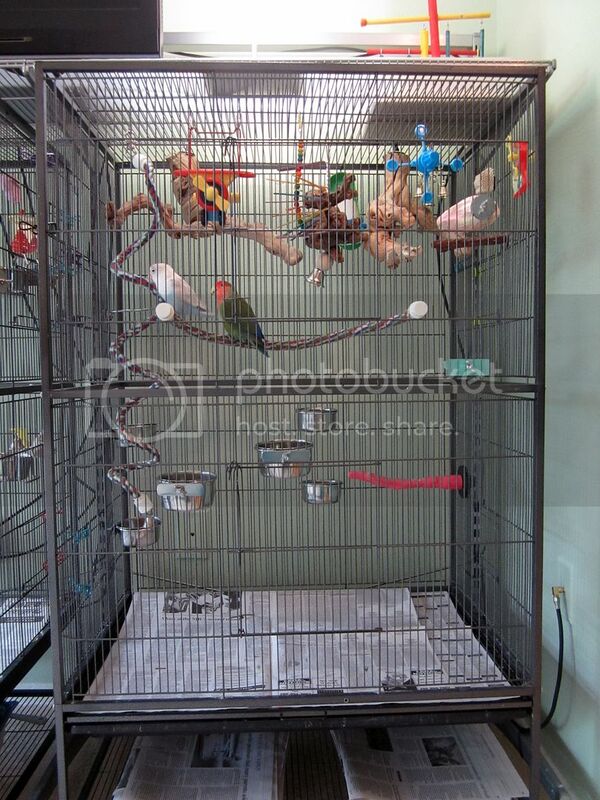 Looks great, but I don't think you actually have any birds, (lol), I don't see even one seed or feather on the floor! Even after I vacuum I always find a few more. Love the look of the bathroom and bedroom Looks so neat and tidy! Beware of Dog? Forget the Dog! The budgie is a Killer, too! There are definitely feathers, I find them everywhere. I went to the store the other day, reached into my jacket pocket and even found a feather there! I know how that is, I find them in the most unexpected places. 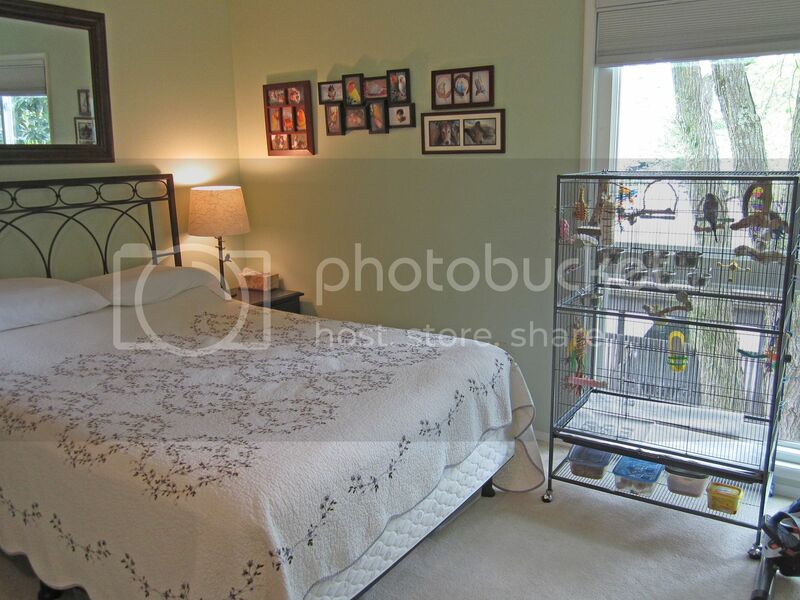 Wow Deborah, it really looks great . It's so professional looking, and I love the colors. The woodland theme is cute, and I love the fox statue . The shelf above the lovies' cages is a great idea. Now I see what you mean about the closet doors off. Good idea there too, I like that. I have those double bi-fold closet doors too, but I can't take them off because it's my clothes closet and I have a bunch of stuff crammed in there . I love my little fox statue and it was nice to give him a new home. 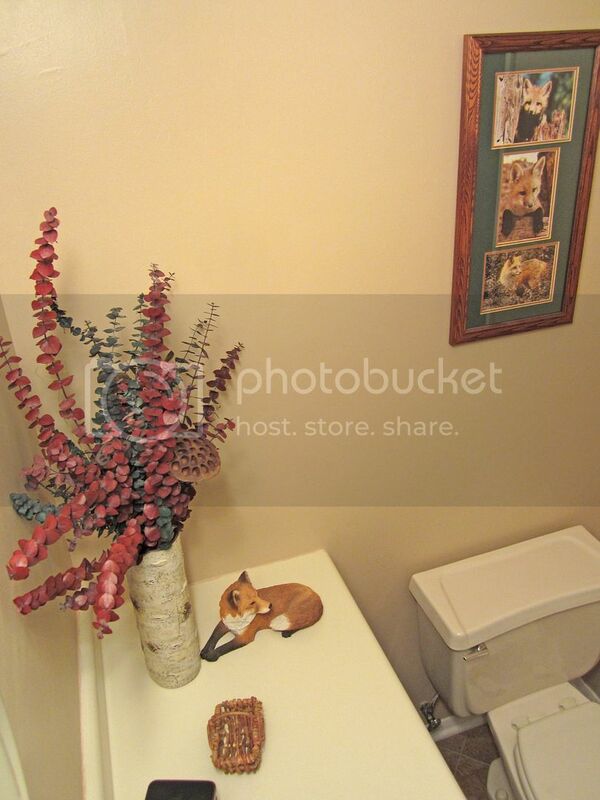 Deb, I love the changes you've made to the powder room. The colours and the woodland theme is beautiful. 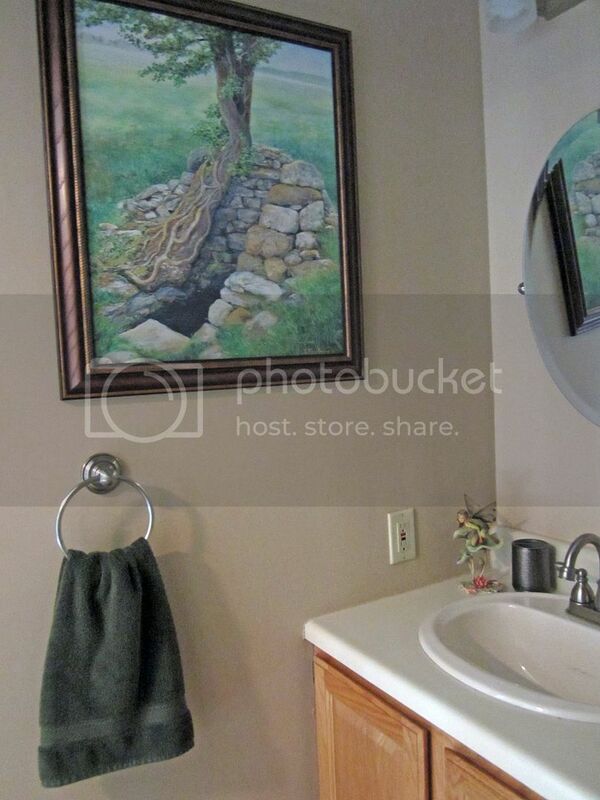 It looks like a quaint little bathroom at a adorable cottage somewhere. 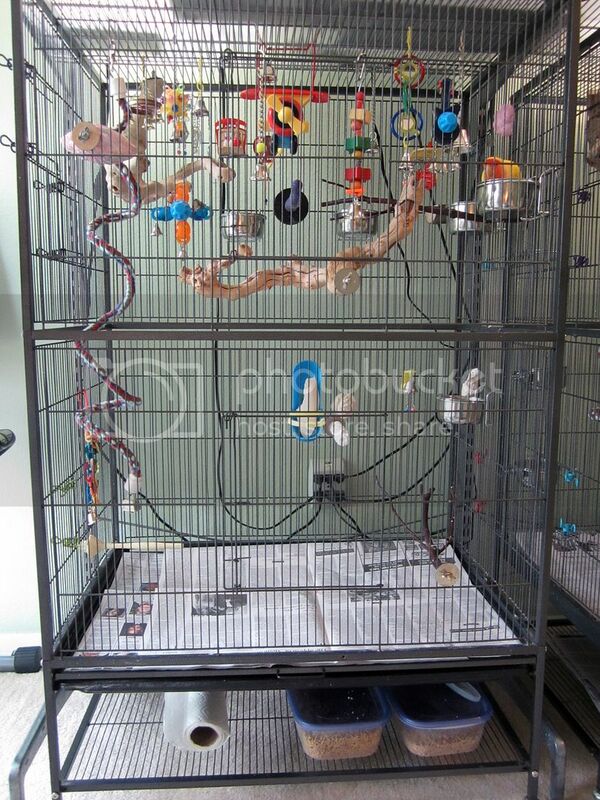 I also love the immaculate room your birds get to share with you.